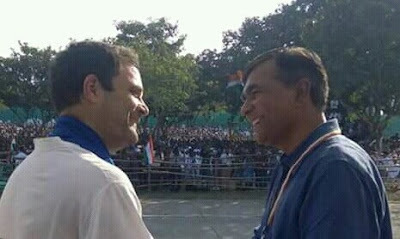 Congress vice president Rahul Gandhi, who reached out to the non-political Dalit Shakti Kendra (DSK) off Ahmedabad to accept the "largest" tricolour of India, refused by Gujarat chief minister Vijay Rupani on the ground that the state government "did not have enough space for it", was in shocked to hear that his party in Gujarat had done "pretty little" in raising issues of untouchability. Welcoming Gandhi for taking the tricolour with "full dignity", DSK director Martin Macwan told the Congress leader in front of about 7,000 Dalits, who had come from all over Gujarat, "We prepared the 125 feet long, 83 feet wide national flag at DSK with our sweat as a symbol of Dalits' national mission to root out untouchability from the country." He added, "We took the flag to Gandhinagar on August 11 with our one-line demand to present it to Gujarat chief minister: name one untouchability one untouchability-free village on Independence Day, August 15. 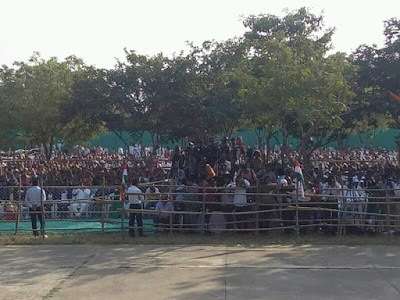 As many as 1,215 Dalits from 120 Gujarat talukas went to Gandhinagar in a 70 km vehicle rally. Rupani refused to accept the tricolour. His emissary gave us in writing that they didn't have any space." Pointing out that they came back to DSK with the tricolour "feeling insulted", Macwan said, "The students and teachers had prepared the tricolour, colouring and stitching it, in 25 days after the clothe, made of khadi by three Dalit weavers in Surendranagar, was handed over to us. It hurt Dalits, who had come from far, when they learnt of Rupani's refusal." Addressing Rahul directly, he said, "We are happy that you came to DSK to take the national flag with dignity, which was insulted", adding, the DSK's mission to end untouchability will continue. It has found expression in the Mission 2047, launched by Macwan being about an end to untouchability in Gujarat. Dishing out figures, Macwan said, "Even 70 years after Independence untouchably has not ended. In a survey we found that in 90% villages Dalits are not allowed to enter into temples, in 55% schools, Dalit children are asked to sit separately during midday meal. In other areas of life also untouchability was found to be rampant." Even as criticizing the ruling party, BJP, for doing next to nothing to end this state of affairs, Macwan emphatically told Gandhi, "I want to tell you that even the Congress in Gujarat has not done anything in this direction. It has failed to raise untouchability issues in the state assembly." Set up by Macwan 1999, DSK provides employable technical training to Dalit young girls and boys, even as educating them in empowerment. During the two-hour programme, the Dalit participants, many of them members of Macwan's Dalit rights NGO Navsarjan Trust, confined their slogans in praise of India's Dalit icon, Babasaheb Ambedkar. Largely a non-party crowd not carrying any Congress banners and refrained from shouting any pro-Congress slogans. Addressing the gathering, Gandhi said, he was "surprised" to hear that the chief minister did not have any space for the national flag, which is why he decided to take it. "They have space for only for five to ten industrialists, and not for Dalits, tribals, OBCs, small traders", he said, adding, "Only they are given land at concessional. If this was Modi's Gujarat model earlier, it has now been exported to the entire country." 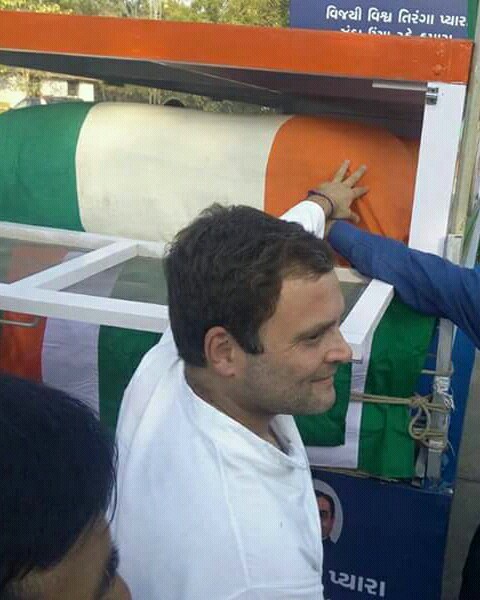 Claiming that his heart has enough space for the national flag, which he would keep in Congress premises with full dignity, referring to Macwan's criticism of Congress for not taking up Dalits' untouchability issues, Gandhi assured him, the Congress has always stood by the marginalized communities, and would do so with renewed strength in future. "We have shown sensitivity towards Dalit issues. I personally stood by the Una victims, and met them. Similarly, we have stood by Rohith Vemula. I stood by the cause he flagged. He did not commit suicide. It was murder. Union ministers are responsible for this", he asserted. No matter what RG does, BJP is going to win in Gujarat. The only hope is that the number of votes garnered by BJP comes down considerably.